1 What is pes anserine bursitis? Pes anserine bursitis is an inflammatory, pain full disorder associated with knee joint. The pain and inflammation can be felt approximately 2-3 inches beneath the knee joint. It is quite common disorders, among other degenerative conditions associated with knee joint. Females are affected more than male. Pes anserine bursitis is mostly related with increase of age. Other associated diseases which aggravate this condition are diabetes, obesity. Athletes who give continuous strain in knee joints for performing their sports activity mostly complain about pes anserine bursitis. Bursae is a sac like structure filled with synovial fluid located almost in all joints and assist smooth gliding during motion and reduces friction between the bones that are joined to a particular joint. These sacs like structures are present in almost all joints which include heel, knee, hip, shoulder and elbow. Pes anserinus bursae of knee joints situated in between the tibia and ligaments of sartorius, gracilis and semitendinosus muscles. Sartorius muscle helps in rotation movement and hip bending. Gracilis muscle helps to move the leg towards the body and the semitendinosus muscles covers the back to the front portion of leg. Semitendinosus muscle also makes connection between lower extremities. These are associated with hamstring muscle to the inner side of the knee and serving nerve supply to the lower- extremities. This provides a prospective place for movement. Another adjoined small bursa named as musculi sartorii bursa, helps to communicate with pes anserinus bursae. 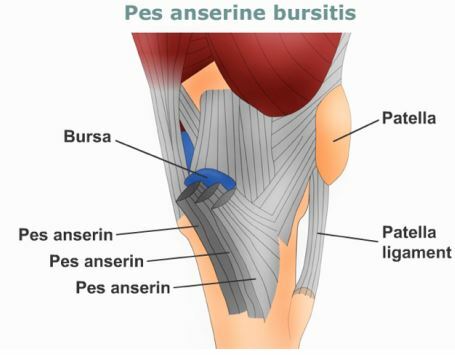 Pes anserine bursitis develop when bursae become stimulated and create more amount of synovial fluid which generates pressure to surrounding tissues and develop pain and inflammation. Gradual pain development in knee joint and surrounding area. Atypical pain is developed approximately 2-3 inches under the knee joint, at the centre of tibia (shinbone). Mountain of hills, or excessive walking or stairs climbing worsens the condition. As symptoms of pes anserine bursitis are quite similar with other knee joint related diseases such as patellofemoral syndrome or osteoarthritis, physicians need to perform clinical examination and properly note the patient history to identify the exact cause of pain. Often doctors recommended X-ray to interpret the other disease like arthritis or fracture due to over strain. Some doctors also preferred to perform MRI, as it provides information of damages and degree of damages at the surrounded area of the knee joint. In case of infection alleged in synovial fluid medical intervention is conducted to collect the synovial fluid from the bursa to diagnose the infectious agent and the severity of the infection. Physician also check the constrain stiffness. To evaluate the stiffness, patient has to lie down with the support of his back, and then gradually bend the hip to 90 degree angle. Try to straighten the knee as much as feasible. The degree of knee flexion indicated the extent of the constrain stiffness. If straighten of knee is possible in optimum level then it indicates there is no constrain stiffness. Take a break from regular exhaustive activities or prefer some exercises which are beneficial for bursae health and excrete excess fluid. Cold compression with ice application helps to reduce the inflammation. Frequent interval with proper duration (approx. 20min) is essential for getting the advantage. Non steroidal anti-inflammatory drugs and other over the counter pain killer may be beneficial to reduce the pain. Steroidal injection, or other local anaesthetic injection at the site of pain (bursa), can also prescribe by some doctors. But these are not a permanent solution. Conduction of closed kinetic chain (CKC), a special type of exercise program can increase the strength of quadriceps. The improvement is noticeable within six to eight weeks. Properly skilled physiotherapist can apply some devices, or other physical stretching exercise recommended by them can be beneficial for this condition. If the symptoms are worsen or persistent, then surgery is the only option. In surgery cases, bursa is removed. This is not a complicated procedure and within 3 weeks of surgery patient gets back to their normal activities. Initially may doctor recommended to use crutches.